NAIROBI-ABIDJAN (REUTERS) – U.S. special forces soldiers were with their counterparts from Niger on Wednesday in the West African nation’s volatile southwest, a growing hot-bed of jihadist violence, when the report came in of a raid nearby. The assailants were believed to be led by Dondou Chefou, a lieutenant in a new group operating along the Mali-Niger border and called Islamic State in the Greater Sahara. A decision was soon taken to pursue them. The mixed force was ambushed by fighters on dozens of vehicles and motorcycles. Under heavy fire, U.S. troops called in French fighter jets for air support, but the firefight was at such close quarters that the planes could not engage and were instead left circling overhead as a deterrant. 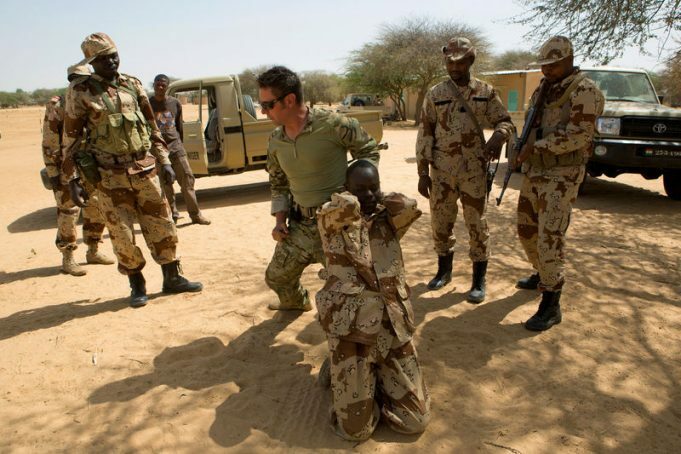 The version of events, as told by two Nigerien and two Western sources briefed on the incident, shines a light on Washington’s increasingly aggressive Special Forces-led counter-terrorism strategy in Africa and its risk of casualties. Four U.S. soldiers died in the firefight, killed in a country where most Americans were unaware that their army is deployed but where Washington has steadily grown its presence. One soldier’s body was only recovered two days later. At least four Nigeriens were also killed and, according to one Niger security source, militants seized four vehicles in the ambush. French helicopters, scrambled after the U.S. call for help, evacuated several soldiers wounded in the clash. After initially offering only scant details of what happened in the Nigerien desert on Wednesday, the U.S. military’s Africa Command said on Friday the soldiers were in the area to establish relations with local leaders. U.S. forces do not have a direct combat mission in Niger, but their assistance to its army does include intelligence, surveillance and reconnaissance in their efforts to target violent extremist organizations. U.S. military deployments are on the rise in Africa. In May, a U.S. Navy Seal killed in a raid on an al Shabaab militant compound in Somalia became the first U.S. combat death in Africa since the 1993 “Black Hawk Down” disaster in Mogadishu. In Niger, Washington has deployed around 800 soldiers, runs a drone base in the capital Niamey, and is building a second in Agadez at a cost of around $100 million. U.S. Special Forces help local troops develop counter-terrorism skills to tackle threats from al Qaeda-linked groups, Nigeria’s Boko Haram and Islamists who have pledged allegiance to Islamic State. “It’s a pretty broad mission with the government of Niger in order to increase their capability to stand alone and to prosecute violent extremists,” the U.S. military’s Joint Staff Director, Lieutenant General Kenneth McKenzie, said on Thursday. Washington has long seen the Sahel as a security threat but involvement increased in the wake of a 2012 occupation of northern Mali by Islamist militants. France led an offensive against the Islamists a year later, and the U.S. government now provides logistical and intelligence support to a 4,000-troop French counter-terrorism operation in the region. “It is discreet but they are there,” a Nigerien security source told Reuters. Analysts are awaiting the political fallout of Wednesday’s ambush with some speculating it may spark a reversal of the U.S. stance on a new regional force – known as the G5 Sahel – which France is pushing but which Washington is cool on. Others however like Ahmedou Ould Abdallah, a former top United Nations official in West Africa and Somalia, recall with concern the American pullout following the “Black Hawk Down” incident. Eighteen U.S. soldiers were killed when Somali militia shot down two helicopters in Mogadishu.